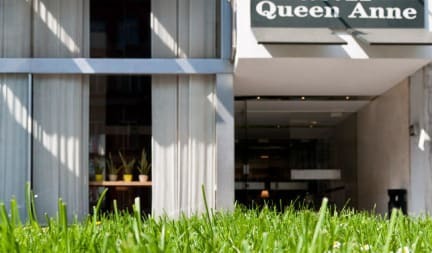 The Queen Anne Hotel is ideally situated in the centre of Brussels's tourist attractions and business area, between the Place de Brouck're and the Place Rogier, and close to the metro station of each. The hotel's rooms, recently and tastefully renovated, are all equipped with en-suite bathroom, free wifi, telephone, automatic wake-up alarm, trouser press and cable TV. For a longer stay, we also have spacious and beautifully appointed suites. A delicious buffet breakfast, sweet or savoury, is served until 10 each morning. 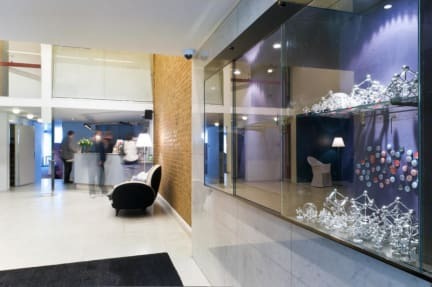 Enjoy the calm and relaxation, looked after by our friendly staff. Please note your credit card will be pre-authorized prior to arrival to further secure your booking: if we fail to pre-authorize it we might be forced to cancel your booking, prior to notification. Good location with a nice double bed in-suite room. It was about 10 min walk to the grand palace. around the hotel was calm and quite, safe. More than anything the staffs are awesome. All the staff, including the cleaners were very kind. I used the single private room which was small, but it had everything I needed. I would strongly recommend this hotel if you like to spend a few nights alone at a cheap price. The overall best thing about this hotel is that it's between the bus station and city center. We were able to walk anywhere in the center (we went to the winter market - so wonderful!). The rooms are very bare bones, but hopefully you're not spending much time there anyway! The beds were comfy. Basic hotel, but good value and location. Great little hotel tucked away towards the north of the city. I twice had housekeeping unlock the door to my private room & start to walk in at unusual times during my stay, but as soon as they realised I was getting dressed they closed the door & left. Otherwise it was a good little room for the price paid. I would stay there again. This feels more like a hotel than a hostel. It doesn't have a hostel atmosphere. However, the location and staff are great. it is the best hotel you can get for the money you pay. Perfect for just a place to stay. Good for one night that i wanted to spend alone. They make you hand the keys in when you go out which is odd but whatever. No lock on your room door which made me uncomfortable as any staff member could have walked in. Excellent location. Possibly the most dated hotel room I’ve ever stayed in.. and certainly the smallest. As I was just sleeping there it was ok but I would really have to weigh up the value of location vs atmosphere before staying again. For the location the price wasn’t too bad (under €60 for a single on a deal) but I think things like a hair dryer should be pretty standard in a hotel room. Plus the noise of the radiator kept me up in the night until I just switched it off. Staff were pleasant enough. Dirty. Found hairs on my towels and beddings. The hotel was overpriced for the facilities provided. When we checked in, the staff did not inform us that the breakfast was not included in the price. At the end of the second day of our stay and after eating for two days in a row, we got to know from the lady who prepared the breakfast buffet that is was not included. A huge miscommunication occurred as we were forced to pay something that we were not aware of.